Thank you for making a pledge to Fund Community Dance Floor!. We will notify you by email when the fundraiser is launched! Fund portable and reusable Dance Floor for outdoor community events! to endorse Carolina Prieto's fundraiser for Franklin Park Coalition. We want dance to be accessible to all in Boston and to increase the number of community-led events in the city's neighborhoods.Help us fund raise to purchase a portable dance floor! If you love to salsa, love to line dance, or just can't sit still at the Elma Lewis Playhouse in the Park concerts, help us buy a community dance floor. By sharing the dance floor with other organizations we'll be bringing dance to more people across Boston for years to come. If you donate $5 or more, you'll become a member of the Franklin Park Coalition and support programs for all ages in Boston's largest community green space. This floor will be available to area partners and organizations. Please contact us if you would like information or to contribute to the purchase of this product. Franklin Park Coalition, like many small non-profits, struggles to raise program funds - so investing in a dance floor doesn't quite fit in the budget. You can help! Bring more people, more movement, and more fun to the park by helping purchase a dance floor for salsa and line dancing outdoors in the summer and at the clubhouse in the winter. Endorse Carolina Prieto's fundraiser for Franklin Park Coalition. Log In or Create An Account to endorse Carolina Prieto's fundraiser for Franklin Park Coalition. 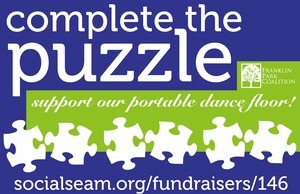 Enter one or more emails to invite a friends or business owners to support Fund Community Dance Floor! The Franklin Park Coalition is a membership organization serving as a community voice for Franklin Park. We inspire others to care for, explore and enjoy a 527-­acre historic greenspace located right in the geographic heart of Boston. Our motto is many diverse neighborhoods, one park community. Join our cause and become a member today! ~ We work for better park management, public transit options to the park, entrance beautification, bicycle access, restoration of historic features, and more. ~ Advocate with public officials to make sure that Franklin Park is not neglected. ~ Produce the Elma Lewis Playhouse in the Park free summer concert series. ~ Hire neighborhood youth for summer jobs restoring the woodlands and promoting the park. ~ Sponsor the annual spring Kite & Bike Festival and other seasonal festivals. ~ Recruit nearly 800 volunteers annually to restore the park’s 220-acre forest. ~ Promote Franklin Park Moves for Health to encourage fitness and exercise in the park. ~ Lead park walks, history tours, and nature programs to encourage city dwellers to discover the park’s treasures. ~ Work with public safety agencies to help people feel safe in the park. Pledge to "Fund Community Dance Floor!" Donate to "Fund Community Dance Floor!"